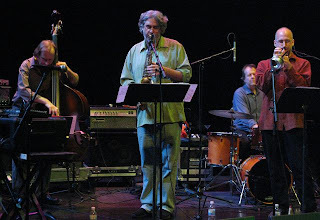 Who: 7 Black Butterflies is Tim Berne on alto saxophone, Ralph Alessi on trumpet, Craig Taborn on piano, Drew Gress on bass, Tom Rainey on drums. 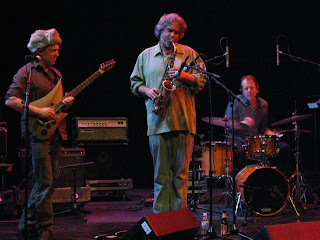 Prezens is David Torn on guitar, Berne, Taborn on electronics (Fender Rhodes, mellotron, bent circuits), Rainey. Jazz at the Walker is always edgy and tonight is no exception. Gress and his group are the opening act for Prezens, which gets top billing. They give us a beautiful acoustic set of improvised music. Since no one announces anything and I’m not that familiar with Gress’s music, I just listen and enjoy. The first piece is fiery and thrilling, the second a gorgeous ballad. I'm listening to the first 7 Black Butterflies CD (2005) as I write this and thinking how much I like the sound. Last night over Mai Tais, Irvin Mayfield’s bassist Carlos Henriquez reminded us he’d been in Minneapolis/St. Paul several times before, with Danilo Perez and Gonzalo Rubalcaba. “A lot of people come through this town,” he said. I remember that as I watch Gress (who was here with Ravi Coltrane earlier this month), Taborn (here in February with Chris Potter Underground), and Berne (here last September with his band Buffalo Collision). Alessi is new to me but I like him a lot. The 7 Black Butterflies set last about 45 minutes—too short. The Walker’s Steinway (which Taborn played in the first set) goes away before Prezens comes on. 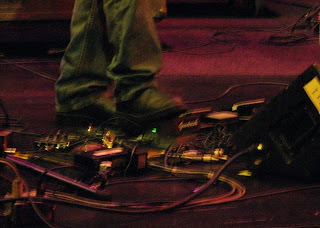 Now the making of music has much to do with turning dials and stepping on buttons and pedals. Torn is wearing a big fur hat and his guitar looks like something out of the Jetsons. Rainey starts out by hitting his sticks together, then transitions to shaking something wrapped in plastic bags. The band crescendos into buzzing and screaming, decrescendos into soft beeps. Taborn dances before his stack of keyboards and boxes with buttons. Rainey plays drums with his elbows and Berne mutes his sax with a water bottle. Torn reaches into the back of a box with a lot of wires coming out of it. I can tell (mostly) what Berne and Taborn and Rainey are doing, but Torn is a puzzle. 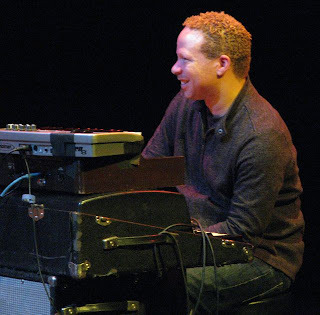 I’m happy to see and hear Taborn and Berne play almost anything, but the Prezens set is a challenge for me. I don’t love it. Since then I’ve heard that Torn’s music is best approached on recordings, since he layers and edits so much. Until now I’ve preferred free/avant jazz best in live performance. Maybe that’s not possible when the music is so tied to electronics?